A while back the Daring Bakers’ challenge was to make a loaf of bread that was shaped in a specific manner and I really wanted to make a savoury loaf. I try and bake a sourdough bread of some sort each weekend and this seemed like the perfect opportunity to make a twisted olive and sun dried tomato sourdough bread, shaped as per the instructions. Sadly, the specific shaping required would not work as the dough was not the right consistency. Not to be dissuaded, I made a simple braided loaf and we had it as a tear and share bread for lunch. 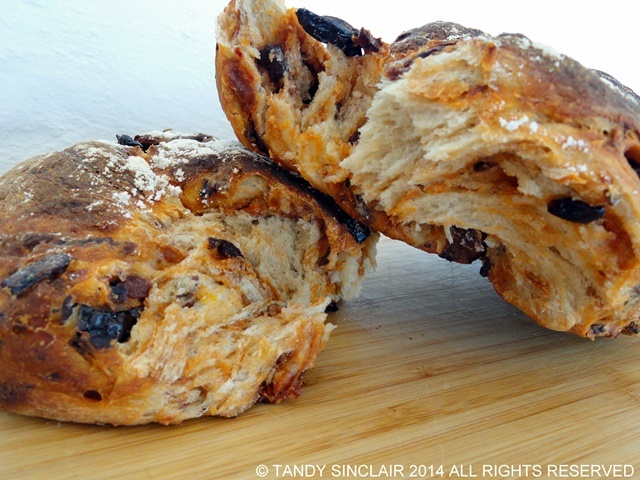 I absolutely love the flavour combination of olives and sun dried tomatoes, and would not hesitate to make this bread again. Looks beautiful – look forward to trying this one out! This bread looks like it has such great texture! I love how we can peek inside. It looks delicious, Tandy! What a great loaf of bread Tandy, you make it sound so easy to prepare. Great combination! I have only ever made one gluten free loaf so I look forward to reading about your efforts! I absolutely like your version of this tear and share braid bread!. Beautiful, Tandy! This sounds like a meal all by itself Tandy. This looks divine and oh my I do love breads – however for the time being i am keeping away from them. Thanks, Tandy! The bread looks inviting to me :). I’m certain the olives and sun dried tomatoes blended well. I love ’em, too! I love the flavour of sun dried tomatoes-they add so much flavour! 😀 This looks like a fantastic bread Tandy!